Your baby has really plumped up. She weighs about 6.8 pounds and she is over 19 1/2 inches long (about the size of a leek). She has a firm grasp, which you'll soon be able to test when you hold her hand for the first time! Her organs have matured and are ready for life outside the womb. 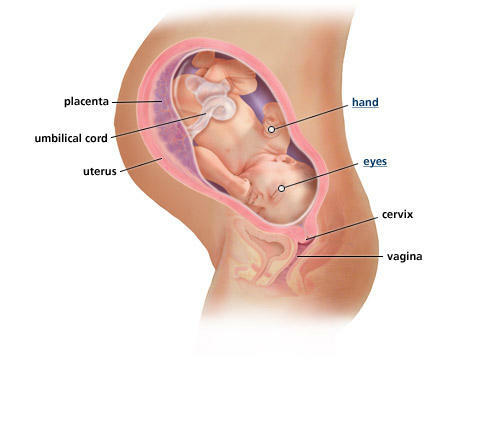 · This week was the very interesting week of my pregnancy. It all started with my daily routine, and of course way too excited to be seen by my OB as I will glimpse a quick look of our unborn since I'll have my weekly ultrasound to monitor the fluid. · Last week, it was perfect I have 10 in fluid, however, during this week's visit came it was indeed alarming as from 10 went down to 5. Meaning, whether I am ready or not, they have to get the baby out or he will be at high risk. · Got my talk with the midwife and then my OB who finally talked about CS or normal delivery. · As I'm very persistent that I would try to do vaginal first and then a C-section if there isn't progress during the labor, the midwife makes sure that if I'll do vaginal I'm close to be dilated. When she checked me, couldn't believe that I am 5 cm and on labor. She was amazed that I never felt any pain of the contraction, which apparently is the tightening that I often felt. Blessed me, huh! · Advise to go straight through the Maternity ward to be admitted. · Went to the hospital to check-in, glad that husband and son and SIL were finally at the clinic to pick me up and went directly to the maternity ward @WCA Hospital here in Jamestown, NY. · The nurses were apparently waiting for my arrival and ask me to wear my gown so they can hook me up and monitor, after less than an hour I was 6 cm dilated and felt no pain at all. Walked to the postpartum lobby for a little exercise to help fasten the labor and all I can feel is a little pressure between my legs and a very tired feet, of course the tightening belly. · OB arrives and decided to break my water. After water was broken, 13 minutes later I have started to feel the unbearable pain in my life, it's as if my upper body is being separated from the waist below. Created a horrible noise to help me ease the pain and after sharp pains I decided to close my eyes and divert my mind into something like "I am only having a dysmenorrhea or really bad cramps" which for me works. · Being praised by my nurse that labor seems to look so easy for me as I was less whiner during those intense pain. I decided not to cry because of the excruciating pain, but tries to relax myself instead. It is very difficult to do it, however, when you are determined of aiming what you want, there isn't impossible at all. · Bathroom works for me, squatting is the best position to have that baby out faster and with that kind of position you'll have a good start of pushing. Glad I never pushed our son in the bathroom, but it was pretty close. · When my body is ready to push I did follow and pushed as much as I can, with unexpected time frame, baby came out fast, blessed it happened as I was about to lose my strength. · There goes the 7 lbs and 20.5 inch baby boy. Born 2 weeks before my expected due date. · This was supposedly a normal weekly check-up just turned out to be the day to give birth. Listen to your instinct mothers, for they will always be right. Here it ends my journey of pregnancy. Thank you all for reading my experience, nevertheless I will never end in here. I will share as much as I can the next level of motherhood which is having a new infant at home, how to deal with siblings [our eldest and the new baby] as well as how I get through a very hectic days. Oh wow, the baby wants ti be with the family in Christmas time. Congratulations! That is so amazing, a check up turned into the actually delivery! I'm so happy with you and that all went well!